Cats are complicated animals. A cat's personality carries through to their behavior, even down to what they eat. So whether you see it as complex or finicky, a cat's nature sometimes leads to tricky feeding situations. Cats are complicated animals. Just one look into those eyes and you know you're dealing with one clever and nuanced creature. 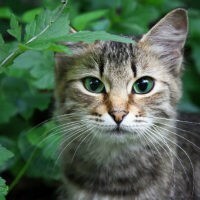 A cat's personality carries through to their behavior, even down to what they eat. So whether you see it as complex or finicky, a cat's nature sometimes leads to tricky feeding situations. For many cats, eating canned food has a textural component. Pate, shredded and stew styles are all available for cats to enjoy in a can so there's a lot of variety to help appeal to your cat's palate and find the perfect match. Cats do very well on a raw diet, it's what they are biologically suited to eat and digest. They are meat-eaters, through and through, so a raw diet is the most natural for cats. But we know some of our favorite felines can be quite picky, so how can you introduce raw to a finicky cat's diet? One option is to mix their favorite canned food with raw food. A tried-and-true canned choice may be just what's needed to help introduce your pet to a raw diet, after all "some raw is better than no raw". Another way to incorporate raw into your cat's diet is to try freeze-dried raw food. As moisture in a cat's food is important, adding canned food, goat's milk or even water to dry food is extremely beneficial. When feeding dry food, it's important to look for grain-free options. Grain is a carbohydrate and a little harder for cats to digest so sticking to grain-free options provide more of the nutrients your cat needs without the unnecessary fillers. As older habits are sometimes harder to break, the best time to start feeding raw is from a young age. If you're getting a new kitten, mix it up and give them a lot of different flavors and textures and, usually, you'll end up with a much less finicky adult cat. With so many supplements and foods to aid in your cat's health, having a varied diet allows you to switch things up to incorporate what your cat needs at that time without a huge reaction to the change in diet. If you're looking to try something new for your cat but aren't certain where to start, stop into The Pet Beastro. We'll show you around, explain what options are out there and which is best suited to your pet's needs. You'll leave with some samples to try and hopefully be on the way to finding a new and healthier diet for your cat.